Yes, the Colonycam/webcam is up and is streaming the exterior view of a portion of our colony. I am NOT thrilled with the stream provider and my apologies for the annoying ads that pop up. 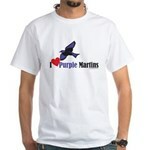 Believe it or not, PurpleMartins-R-Us.com gets nothing for those ads. If I want to stream the webcam without the ads I have to fork over about $100 a month. So unless I win the lottery, that isn’t going to happen. I am investigating other ways to stream the cam but it’s all a learning process so I beg for your understanding and patience. We are up to about 5 ASY purple martins here at our colony in Florida. The last few days had some cold temps in the 30′s at night and tonight and tomorrow will have strong rain showers with high winds. I wanted to re-post one of my favorite posts regarding cold weather and supplemental feedings for those up north that will be getting martins soon. Since flying insects are pretty much dormant when temps dip below 40 degrees having supplemental feeding trays available can be just as welcome to purple martins as birdseed to cardinals. Purple Martins in West Palm Beach, FLORIDA! While outside getting something out of my car I happened to look up and Lo and Behold, a ASY female purple martin was flying over head. In their distinctive ‘flap flap glide’ she circled lazily over head, casually feeding. I rushed inside panic striken since all my housing was closed and started cutting the white plastic bags that I had placed over each gourd. Placing large handfuls of pine straw that my husband collected from a wooded lot down the street, I then was able to hoist one of my gourd racks and my MPP (multi purpose pole) system up. The purple martin then flew around diving and chirping a few times before flying up to feed again. 2011 Purple Martin Season UNDERWAY! It is official! The first purple martins for the 2011 season have arrived. As usual, the West coast of Florida lays claim to the first purple martin “scout”. On Jan 5, 2011, Dr. Steven K. Million of Lake Suzy (Lake Suzy is west of Arcadia and east of Port Charlotte and Northeast of Punta Gorda), Florida reported the first martin. Fort Myers (first to report purple martins last year) followed suit on 06 January at a colony affectionately named the Purple Martin Hotel At Gateway. Of course, we ALL know that there are NO purple martin scouts. Even the PMCA agrees. What some folks call scouts are just older more experienced birds returning to their old colony sites to secure a nest spot. They simply stop at other sites along the way. Now in my opinion, (considering how gregarious purple martins are) when they arrive in such small numbers they are seeking out other martins to socialize with so maybe they are simply seeking out their own. For our colony, I suspect the martins won’t arrive for a few more weeks. If you are like me then you still need to buy those replacement purple martin house doors, a few extra gourds, heck maybe a new purple martin system. So now is the time. We recommend making all repairs and most minor changes BEFORE your purple martins arrive.